yesterday was both my friend's birthday (happy birthday lil) and pi day. hoorah! it was inevitable that i made a pie (with my friend julia). a vegan blueberry pie. although pie is one of my favorite winter/spring desserts, i've never actually made one without the assistance of an older individual... most likely because a) pies seem so difficult because of the butter-freezing and the dough-freezing and the crust-forming and rolling. b) the cooked-crust-consistency that varies from the bottom of the pie to the top. c) there's social stigma about pies. but today was the perfect excuse to do all of these things. making a pie for pi day is also a perfect reminder that i actually have time to do stuff now because i'm on spring break. FINALLY. 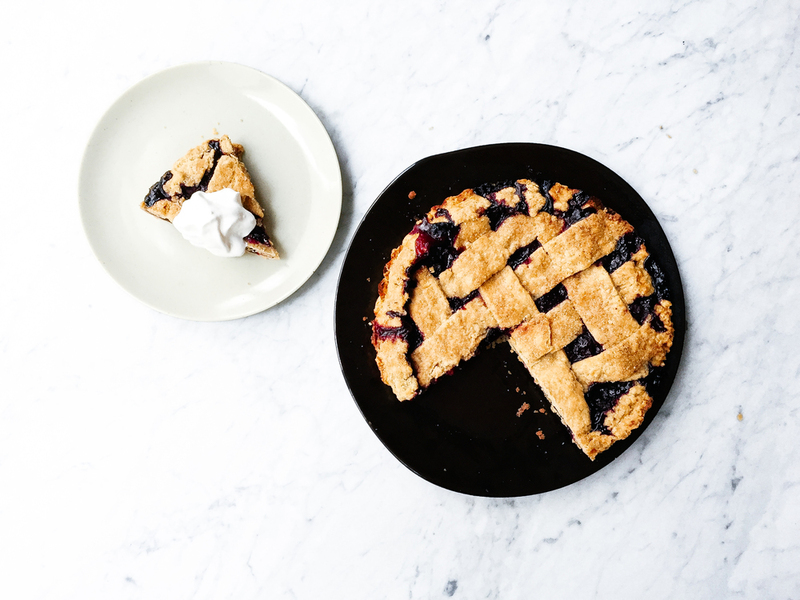 so i present to you a simple, vegan, blueberry pie because blueberries are really great. 03/ sift flour and salt and mix together. using the pastry cutter, combine butter and flour mixture until thoroughly combined. 05/ with water-coated hands, split the dough into two even pieces. roll into a ball and flatten out into a disc. cover with plastic wrap and place in the freezer for at least 30 minutes. 06/ in the meantime, combine all of the ingredients for the filling. taste test if necessary, (always). refrigerate until the dough is ready to be rolled out. 08/ spray your pie pan with canola oil. roll the dough onto the rolling pin and transfer it to the pan. roll out into the pan and begin to push dough into the creases and edges of the tin. pour filling into the tin and place in freezer. 09/ repeat step  with the second disc. 10/ use a pizza cutter or knife to cut dough into 8 strips, each about 1" long. 11/when done, take out your unfinished pie. create a design of your own or make a lattice crust on top. 11/ freeze one last time for about 10 minutes. take out. brush with oil and sprinkle turbinado sugar on top. cover edges with aluminum foil to prevent them from burning. 12/ bake for 45 minutes, taking off the foil after 20 minutes. let cool before cutting and eating. it will be very hot.